LEARN HOW TO ICE CLIMB? Before jumping into the sport, it is important to have some upper body strength to be able to swiftly dig an ice ax into frozen ice. It is best to begin top roping on a shorter pitch and then work toward more advanced routes. You might want to take an indoor rock-climbing class to learn the basics for proper belay techniques, use of rope systems, tying in safety knots, belaying, abseiling, and lowering. Learn these techniques before attempting to ice climb. Taking an ice climbing course or an avalanche course is also a good idea because some of the climbing approaches are in avalanche slide zones. Ice climbing is a gear intensive sport, and a climber will choose the equipment according to the slope and texture of the ice. Serious ice climbing requires a stiff leather boot that is crampon compatible. In vertical ice climbing the technique involves kicking the leg with the crampons in the ice to get leverage while swinging the axe into the ice above the head. Since both crampons and ice axes are sharp gear, it is important that you get a good work-out routine together to get a strong upper body. If the ice is strong, you only need a centimeters or so to pull up on. Just make sure you have the safety in place. Trust your holds and pull up. As I mentioned if you are leading the climb, it is important to place safety screws in place in case of a fall, but with top roping the belayer will be your protection. Figure out what type of ice you plan on climbing and choose equipment according to the slope and texture. Ask questions like how far is the approach? 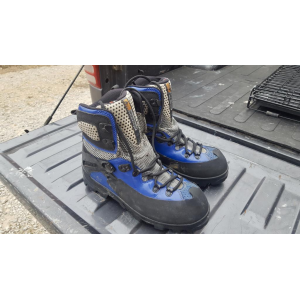 Do I need a soft mountaineering boot or a stiff leather boot that is crampon compatible. Most all boats should be stiff in order to support the climber and maintain ankle support. In order to move up the length of the ice, the climber mush engage both legs and arms kicking their legs with the sharp part of the crampon to gain traction. Usually after you have secured your feet position on the ice, hold on with one ax while you swing the other axe above your head into the ice. A proper position on the ice with your feet is to have both feet pointing forward toward the ice with the use of the spikes from the crampons pointing into the ice. All the weight and traction is directed to the top of the climber and gives them stability and security to move up with their arms. In this position, it may fatigue the calf muscles when held for a long period of time. Keep your elbow near your ear as you swing, but not too close that you can hit yourself with the axe (does not make for a fun day out on the ice). As you swing, watch the pick to make sure the placement is accurate. You might want to look away as the ice debris will spray. In that case duck your head toward the ice as the pick connects and give the pick some power. Make sure that the ice pick is secure into the ice before pulling up on it. Outlined below is a method for moving up on the ice with a three part technique known as SQUAT, STAND, and SWING. When you have the two axes solid overhead, now is the time to bring up your feet. Keep your upper arm straight and bring up one foot at a time as you kick into new footholds as far up as you can and place both feet at the same level. Now you should be in a tucking position arms overhead and feet directly into the ice at the same level. Your knees should be just below your hips but also look around for other foot holds such as ledges or holes in the ice. Professional climbers usually move their foot more times than arms. While standing up on your crampons plan where you will place your next tool. usually about a foot to two feet above where the current piece is currently located roughly shoulder width apart. Now comes the fun part, trust your feet and stand up toward your upper axe. The strength will come from your legs so practicing squats at home will increase your fitness and strength. As you are standing up you will need to release the lower ice pick by pulling opposite upwards agressively. Make sure you do not pull the ice ax into your body. Then when you are ready and standing, use that lower axe that is now loose to be higher than the current tool. It is always a good idea to keep the ice tools staggered. This will prevent one or both from getting stuck. As this might seen strange, you do not have to have a deep hold with the ice axe, just deep enough to keep you stable and strong enough to pull yourself up. Keep in mind that does take some strength to put it into the ice. Give the tool a sharp, downward tug; if it holds, it will stay put as long as you keep pulling down on it. At this point you should be in a relaxed position as if you were hanging out on a ladder with both your feet on one rung. Now you have mastered the basics for the sport. Keep repeating this technique until you reach the top! Well done! – Many of the dangerous that occur with this sport is climbing in avalanche prone zones. If you are approaching a climb in one of these areas, makes sure you check the avalanche report, bring your avalanche gear and tell someone where you are going. – Ice climbing gear is a hazard in and of itself because of the fact every piece of gear is sharp. Be aware when you are using the gear that the edge can easily cut you and your clothing. – Check the stability of ice. If you are uncertain, make sure you set up a top-rope first to secure that the ice is strong enough to hold your body weight and is not brittle that it will break off after each time you place your feet or axe into the ice. Brittle ice is not only dangerous for the climber but also for the belayer below. – DO NOT go anywhere around ice without your helmet. Surprisingly just a small sharp piece of ice falling from the sky (which is quite likely) can and certainly ruin your day ice climbing. Be smart. Your head is a beautiful thing to keep intact. – Using the correct gear will help you to stay warm and make the experience more enjoyable. This entry was posted in ACTIVITIES, LEARN HOW and tagged ice climbing, Learn how to ice climb, winter adventures. Bookmark the permalink.